"Didn't you ever want to change the world?" 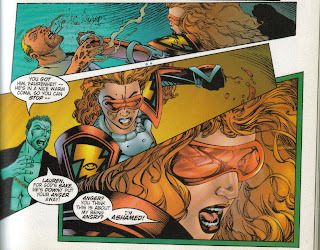 Warren Ellis took over writing duties on Wildstorm's flagship title Stormwatch (the Storm in Wildstorm) in 1996, with pencils by Tom Raney and colors by Randy Elliot. While it wasn't a best-selling title, Stormwatch was notable for not sucking the paint off the walls, as most superhero comics did back then. For those who may have blocked out the memory, the 1990s were not exactly the pinnacle of graphic art and storytelling. Visual aid! Guess who that hot mess with the spiked shoulder pads and superfluous thigh pouches could be? That's Batman. As in, the G-ddamn Batman. The 90s, everybody. Stormwatch started in 1993. It wasn't part of DC Comics then, but rather a creator-owned property (in this case, the creator was Jim Lee, who is now the co-publisher of DC Comics) published under the Image brand. I haven't read the Jim Lee Stormwatches because I was living on an island with no comic book stores in the middle of the ocean at the time, and they were never collected in trade paperback. 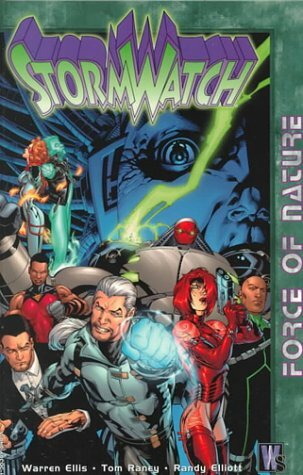 Ellis's run on Stormwatch, however, is still in print, and Force of Nature has a big ole number 1 on the spine, so apparently his is the Stormwatch that counts. 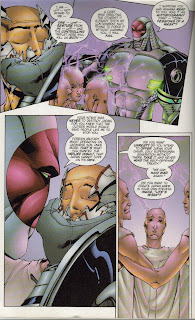 When Ellis entered the scenes with Stormwatch Issue 37, he immediately cleaned house. He got rid of most of the old Stormwatch heroes and brought three new ones--Jack Hawksmoor, Jenny Sparks, and Rose Tattoo--into the ranks, basically saying, "Everyone who's shite, you're out." He'd say shite, he's English. And because he's English, his storylines were heavily influenced by the Great British Comic Book Invasion: Brit creators schooling us dumb Americans on how comics should be done. Alan Moore, Neil Gaiman, Grant Morrison and Garth Ennis were part of this wave of talent, and Ellis's early Stormwatch issues owe a lot to their mix of horror and political commentary. A quick note on the artwork: that's as American as bourbon and birth control pills. Tom Raney's pencils remind me of watching MTV's animation block late at night with my cousins. Comics in general may have gone overboard on decadence in the 90s, but Raney hits that sweet spot of Liquid Television/Aeon Flux that just crazy enough to work, damnit! His pencils (and Randy Elliot's colors, the inking in these issues is top notch) bring a seriousness to Ellis's writing, and while the artwork is definitely of its time, it holds up well because it's just that good. Stormwatch is the United Nation's superhero team, captained by Henry Bendix, the Weatherman, who watches over the world from an orbiting space station called Skywatch. The first issue, as I mentioned, has Bendix firing most of his superheroes and reconfiguring the rest into three different teams, Stormwatch Prime, Stormwatch Red, and Stormwatch Black. The first two issues are a little uneven. Teams Prime and Red stop a naked German guy's bloody rampage through a snowy forest village. Then one of the fired Stormwatch heroes dies at the hands of the US government and now Stormwatch and America can't be friends. Things pick up a bit in the third issue, when Stormwatch Black infiltrates an East Coast city to take out fascist superhuman police officers. Jenny Sparks, Jack Hawksmoor, and Swift would eventually found Ellis's most famous superhero group, the Authority, and it's interesting to see them doing these urban black ops when I know that in a few short years, they'll be ruling the world. 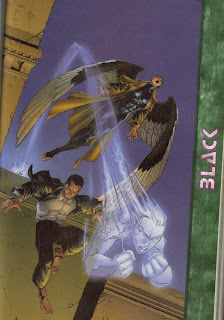 Jenny and Jack are Ellis's own creations, but Swift, a Tibetan woman with wings and talons, was one of the original Stormwatch heroes, and it's no surprise that Ellis kept her. "There is little in her life not tainted with horror. Her old home, Tibet, is almost a phantom place... Now she is a citizen of the world; and she wants to be the last child whose bedtime stories rang with murder." This is what Ellis's Stormwatch is all about: protecting the disadvantaged and oppressed. Going after the generals, not the soldiers. 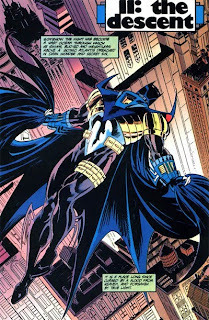 To show just how original this idea still is for superhero comics, compare Swift to Batman. Batman has a similar origin and motive, but the death of his parents by a random mugger was an intensely personal act; his crusade against crime is more pathological than political, because he projects his feelings for that one criminal onto all criminals. Swift, on the other hand, was the victim of geopolitical upheaval and cultural displacement. One of the world's superpowers stepped in and destroyed her country, and no one stepped in to help because hey, politics isn't street crime, it's a delicate business, let the professionals sort it out. Where were the superheroes then? Fighting dudes in clown makeup? I'm sure the average Tibetan refugee in India is very happy to know that Gotham City is safe from escaped mental patients for another month. So here's Stormwatch Black, addressing human rights violations on an American police force. It's a good start on the path to making superheroes revalant to real world problems, but man, clumsy, clumsy take on the villains. The superhuman police officers in this city are racist, bigoted ultraviolent parodies, like the only thing Ellis knew about American police officers was what he learned from watching the Rodney King tapes. His attitude toward America is the major flaw in Stormwatch: not necessarily because he was wrong about us--we do tend to get snippy when the UN tells us to do stuff, and there is some truth to that loner, trigger-happy vibe Ellis's Americans give off--but he just beats the reader over the head with it. The American Stormwatch hero Fahrenheit kicking the crap out of the American soldier who killed her former teammate because "I'm ashamed" to be American--well, 90s decadence didn't stop at the costumes. But we somehow manage to stumble into the sweet spot with the fifth issue, "Activator," a creepy little story about an American teenager in a small town who's experiencing the first stages of a blooming superhuman talent. There isn't anything genre-shattering about this story, or even particularly superhero-y, but it works: the widescreen panels, the rain and shadows, the frightened mother, the murders--it all just sends a chill down my spine. A solid issue that plays by the rules. Then Ellis just floors it to crazytown in the sixth and final issue in the volume, "Kodo," switching gears from judging America's flaws to judging Japan's. I appreciate what Ellis is trying to do with this piece, and I applaud him for even trying. Superhero comics are often so narrow in their Western mindset, so stuck in American cultural values, that for a writer to address superhuman threats as they appear from INSIDE another culture feels brave and bold, even almost 15 years later. Batman and Green Lantern were fighting space zombies this year; Superman is walking across America in 2010 like some kind of spandex Johnny Appleseed. I don't think much of Ellis's villain, an eyeless mutant conceived in the aftermath of the Hiroshima bomb who is obsessed with restoring Japan's honor after its surrender in World War II. But hell, at least Ellis was TRYING to make comic books applicable to the real world. And as with all the Stormwatch comics, Ellis's snappy dialogue and Raney's vivid artwork more than makes up for the awkward polemics. So, to recap Stormwatch: Force of Nature: there are, admittedly, some flaws. The political commentary is clumsy and heavy-handed, and that's a problem with politics has such a huge role in the stories. But you can't completely reinvent comic book superheroes from the ground up without making a few mistakes, and I forgive them all because Stormwatch is just so much damn fun to read. The seeds of greatness are there in these early issues. I can't wait to see what happens next. I don't have the trades, but I do have most of the single issues of Ellis's Stormwatch. Good stuff. I like your take on it!